Alright 2013. You’re here and we’re ready for you. New beginnings. Time to take a look around and see what’s working and what needs to be changed, in our family rhythm and in our home. And what better time to do it than when we are all full of hope and excitement for the new year. We have decided not to send Jack (3.5yrs) back to preschool this year. While he did enjoy it there, it wasn’t quite the experience we were hoping for. He didn’t have as much opportunity to explore his interests there as we would have liked and so it seemed to hinder the flow of our week in many ways as opposed to compliment it. 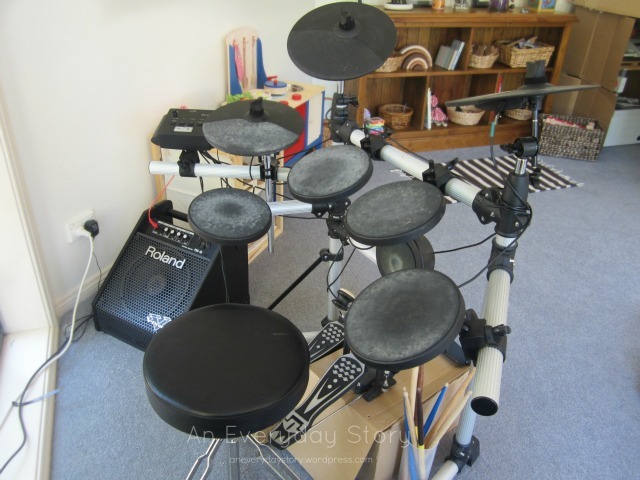 So to celebrate, in a way, our official leap into homeschooling, there were a few things that needed to change; we would need a new weekly rhythm and our play areas could do with a dash of fresh inspiration. I do love a little reorganising, everything feels so reenergised and new. 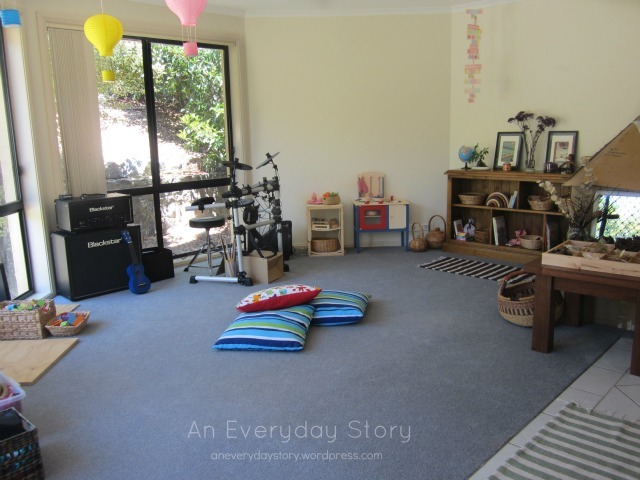 We love our playroom. But you know how things can get a little stale after a while? Well that’s how I was feeling about this space. That, coupled with all the generous gifts Jack and Sarah (20 months) received at Christmas, well it was time for a change. Here’s what it looks like now. I took out the couch making more room for play. Jack and Sarah play a lot of dress-ups and dance, now there’s plenty of room to move around without bumping into each other. I had a few specific changes I wanted to make; I want to make storytelling and song a part of our everyday, as well as focus Jack’s passion for music a little more and try to build on his interests. So I brought his drum kit into the room and made a shelf for instruments. 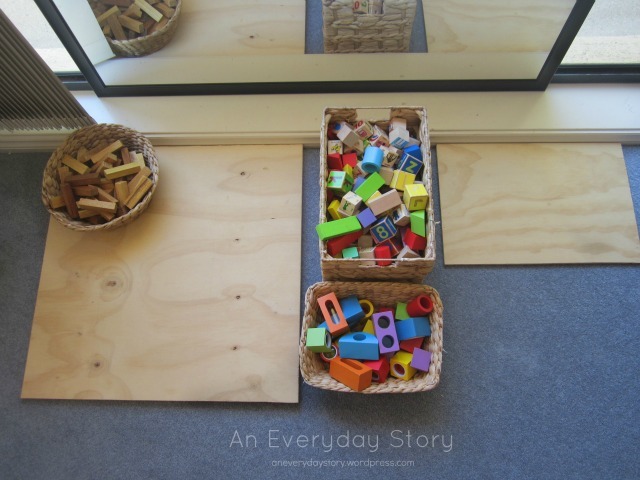 This way we can more easily incorporate music into our play and story time. I also want to introduce the children to more whimsical fairytale type stories to ignite their imagination more. We have many non-fiction books as well as simple children’s stories but I really want to introduce them to mermaids and knights and wizards and dragons and all those wonderful magical characters. So I have added a couple of new books to the shelves (you can see them in the first picture) next to our gnomes and story stones. I’m looking forward to seeing where Jack goes with these. Oh and if you have any recommendations for wonderful whimsical stories I would love to hear them. It’s a little tricky trying to find stories which aren’t silly animated ones. Our nature table is still one of our favourite areas. I like it in this new space though, next to the shelves, funny how a simple move can reinvigorate interest, isn’t it? This year I hope to start a nature journal with Jack. He has been journalling at night for a little while now and so is familiar with the process. He enjoys recalling what he has done during the day and drawing pictures in his journal. He is also able to practice writing by labelling his drawings. This has been such a great way for Jack to learn to write, it’s purposeful and relevant. He is labelling his drawings, choosing the words, he is interested and wants to learn. Really can’t ask for more than that. I think we’ll keep the nature journal near the nature table, that way he can use it after a bush walk to record the things that he saw and found. The block corner of course remains. This is Jack’s favourite activity at the moment and Sarah is starting to stack blocks too now. None of our blocks have been expensive. The coloured ones and the window blocks are Imaginarium brand from Toys ‘r’ Us and the plank blocks are a generic Jenga game I picked up from K-mart for $5. The mirror and baskets are also from K-mart. The mirror was about $12 and the baskets were $3 for the round and a little more for the square one (I can’t quite remember). So it doesn’t have to cost a lot to put together a block corner. 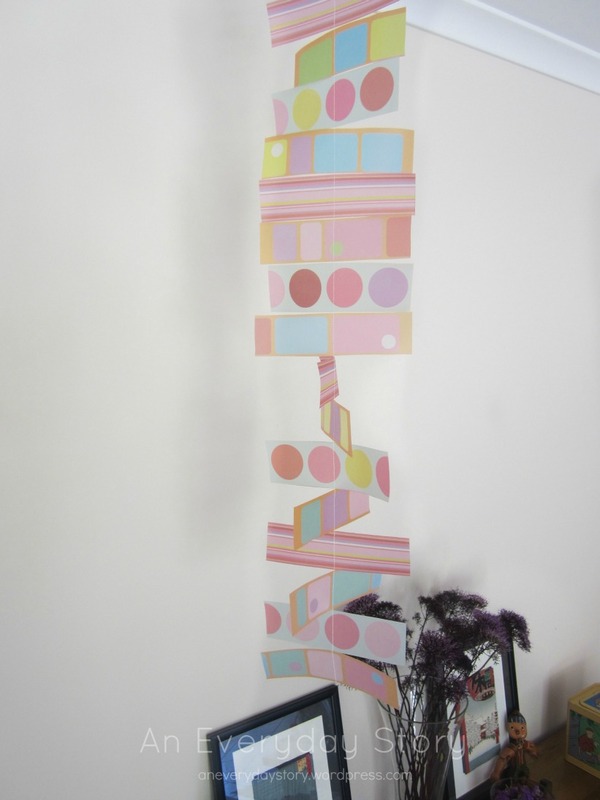 Lastly, I made this simple mobile from velum paper. Now I know you all have some scrapbooking paper hanging about. It was so so simple, just cut into strips and then sew one after another down the middle. Easy. I got the idea from Christie who originally got the idea from here (there’s a simple tutorial too). I love it and it spins so beautifully in the breeze. So this is our playroom. We have a light panel and the OHP in a fabulous cardboard cubby which my husband made and a few baskets of dress-ups too. The kids and I are loving it. I love these kinds of New Year’s resolutions. The kind that you can just get in and do while your motivation is still strong. I’m looking forward to hanging out with the kids in there a lot more. Next up, a new weekly routine. We have all 5 days to ourselves now. I’m looking forward to time for ongoing projects, bush walks, baking, art and gardening. As well as storytelling and song. It’ll be nice. such a beautiful space — love that you cleared out some room for them to dance or stage larger dramatic play scenes. in my experience, when you give children a larger space, then think larger to fill it! That really is a beautiful space! I love how it feels so open and inviting. What a lovely space. Thank you for the inspiration! Can you Catch a Mermaid is a lovely book with beautiful illustrations. The Lauren Child versions of Goldilocks and Princess and the Pea are also worth having in your collection, they are both wonderful beyond imagination. My kids still love Enid Blyton, I’m not sure how many of the old fairy books are still in print but you could probably get 2nd hand ones. My girls also love the rainbow fairies etc. they are formulaic but not too twee. The paper bag princess is a great introduction to non traditional princesses and dragons. My kids like Titch Witch and Winnie the Witch and a lovely book called Shhhh about a giant. Thank you so much Rachel. I had a look on ebay and there are some Enid Blyton books up for sale at the moment so I’m going to bid on those. I am going to see if I can find the other ones you recommended. Thank you again 🙂 Here’s hoping I can find them. Thanks so much Steph for the book recommendations. I had a quick peek and they do seem quite lovely. I am very new to these stories though. Are there any in particular that you own and would recommend? I wonder if you know what an inspiration you are! What a beautiful space and I’m so thankful you shared the details! This is such a great light and open space. All the natural elements are great. Thanks for sharing. Thanks Dawn. We are very fortunate to have this room. It has 3 lovely tall windows and a sliding door to the yard so it gets a lot of natural light. It’s a lovely space to be in. The Tim Seldin book is really useful, isn’t it? It was the first book I bought when I first started reading about Montessori. 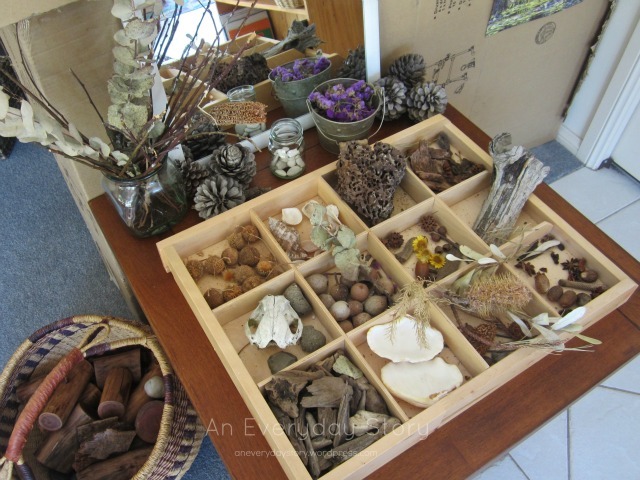 We mostly do Reggio-inspired learning here so a general understanding of the principles of Montessori is enough for us. We do a lot of practical life activities – real life activities – and try to set up our home so it is welcoming and accessible for Jack and Sarah. 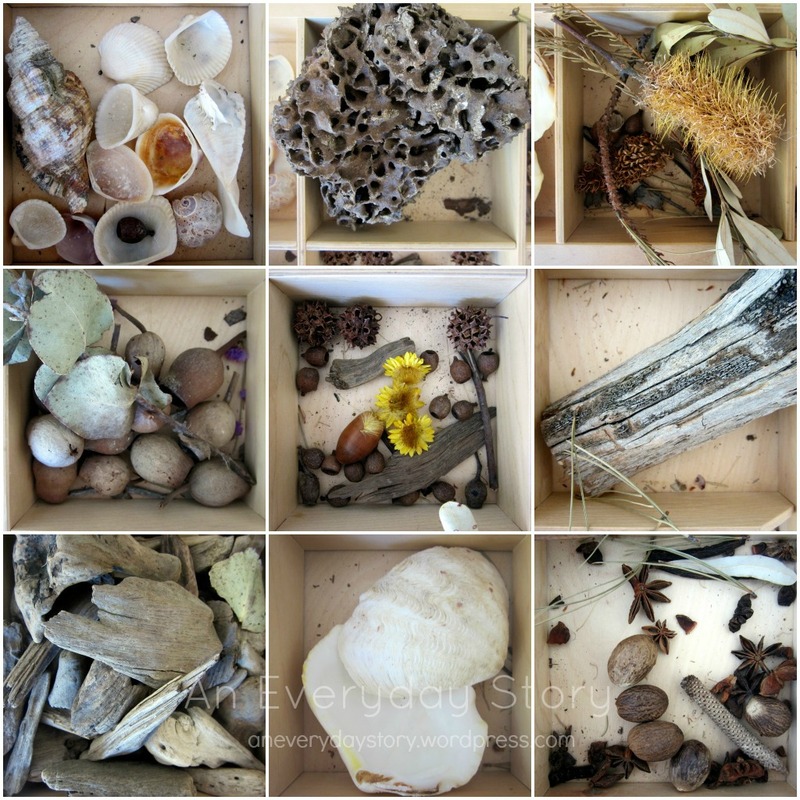 Beyond that, a lot of our learning is Reggio-inspired. I can really recommend Lori’s book – Project-based Homeschooling. 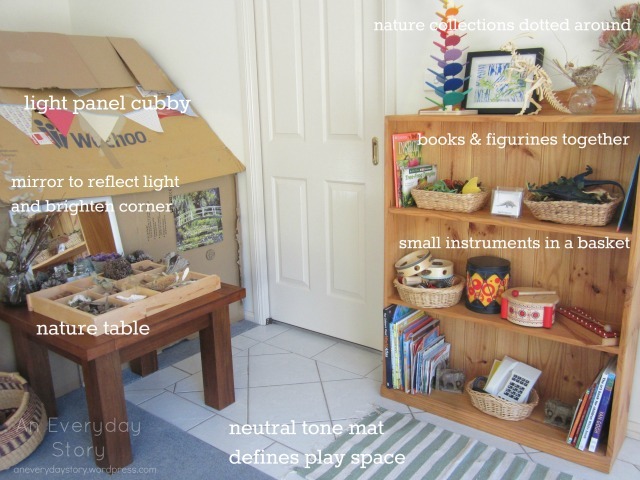 Looks of really inspiring practical suggestions for child-led explorations. I have just found your blog and am looking forward to following it. Your playroom is so light and inviting! Your nature area has inspired us to make one of our own. Thanks for sharing! I hope you don’t mind me mentioning stories I’ve written which your children may like – http://www.StoriesAndChildren.com. This is a beautiful space. Like others, I am very inspired and love coming to look at your blog. I’ve been wanting to change my set up for my 20 month old and wonder if you have thoughts about playrooms vs. integrated play areas…. Actually, we don’t have much of an option space wise, and as she is still little, and no siblings, it makes much more sense to have various corners throughout the house for her to work. But I’d be interested to hear if you had any thoughts of ideas about this. Thanks for the inspiration! Before we moved to this house our other house was much smaller. We didn’t have room for a playroom. So up until Jack was about 2 years old we had little spots dotted around the house. It worked quite well. There was a spot in each of the main rooms and then Jack’s bedroom. 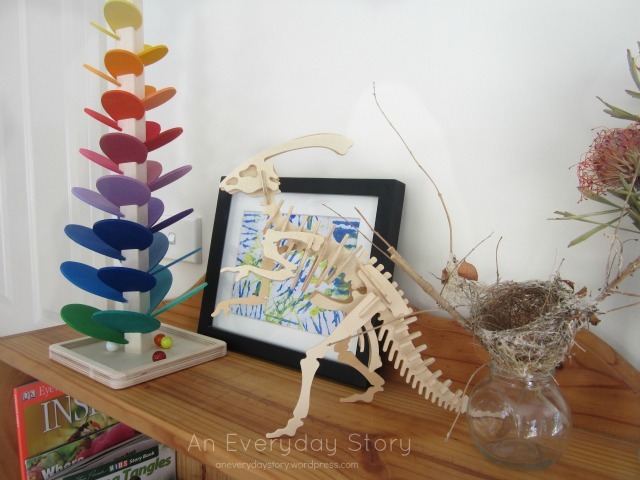 He had a small art space in the tiled dining/family room (just a small table and a low shelf with some crayons, paper, textas, collage materials, that sort of thing – nothing too complicated), the bottom shelf of a bookcase at the other end of that area with a few simple toys. 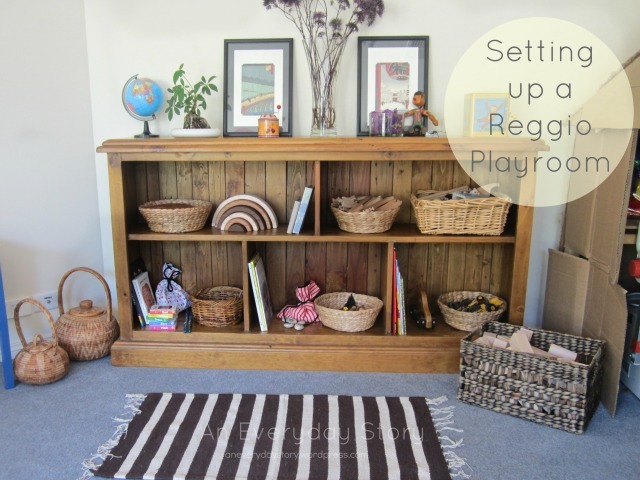 And then the shelving we use in the playroom now was in the lounge room. If you can, I think it is better to have the toys arranged simply and neatly rather than a toy box. This ways your little one can see what they want and get it themselves. Also each toy then has a spot and they can (well in theory – definitely doesn’t always happen at our place 🙂 ) put things away again. Good to know you had that set up! And yes, I totally agree about toy boxes. We already have just a few toys out, arranged in a simple manner, and I occasionally rotate things and swap things out. (though so far I’ve worked hard to not collect a huge mass of toys, preferring to have natural objects, complimented with a few well chosen toys.) I’m glad to know that having areas around the house worked for you. We tend to live mostly in one or two rooms in winter, too, since the rest of the house is cold! Thanks for the reply, and I’m now looking forward to revamping her areas! Your room looks wonderful! I’ve been thinking recently about putting books away because we LOVE books around here, but they are everywhere! Have you got this Puff the Magic Dragon book? My son always looks in awe at the pictures, and he sings the song with me. If your son loves music, this would be right up his alley! I sometimes think the same, we love books too and I know I have read that you can never have too many books but I think maybe you can. I find, just like with toys, if there are too many books they seem to get read less often. We have a book basket in Jack & Sarah’s rooms with about 10 or so books and then some books in the playroom. This seems like a good amount for us. 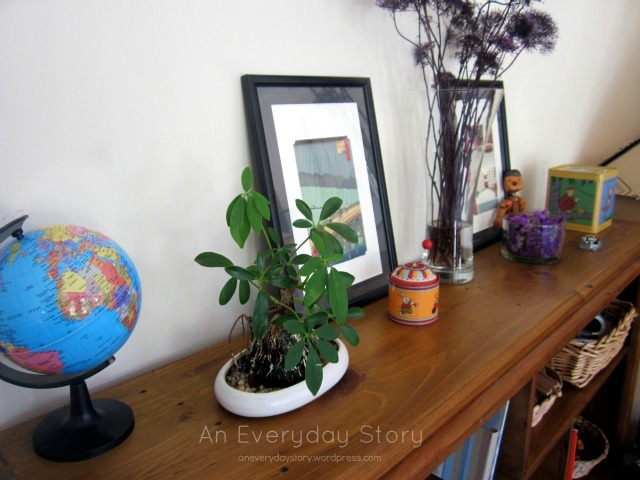 This post is so inspirational, I love looking at all the pictures and getting some new ideas. Thanks so much. Hi. I know this post is from the beginning of the year but I have just stumbled across it. Such a beautiful and inspiring room! If you are still after whimsical stories, I would recommend any of the classic Enid Blyton books (e.g. the Wishing Chair and the Magic Far Away Tree). Although old fashioned, they are filled with beautifully described adventures and wonderful whimsical characters. If you can get your hands on a vintage copy even better, as the illustrations are wonderful. Thank you for this post, I am very inspired! Thanks Ashleigh-Rose. I love Enid Blyton too. I was trying to get some original editions on Ebay but was sadly outbid. I might have another look though. They would be so wonderful to have in our home library.